Protect the skin you (and your baby) are in. 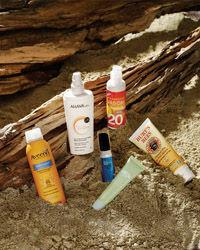 Aveeno Hydrosport Sunblock Spray SPF 50, $8, adheres to wet skin, providing protection even in water. Ahava Mineral Sun Protection Anti-Aging Moisturizing Spray SPF 30, $25, contains minerals from the Dead Sea. JÄsí¶n M Facial Natural Sunblock SPF 20, $12, is oil-free and infused with grapeseed and soothing green tea extracts. Burt’s Bees Chemical-Free Sunscreen SPF 30, $6, uses titanium dioxide. Origins A Perfect World SPF 35 UV Face Protector with White Tea, $28, is rich in antioxidants. Peter Thomas Roth Instant Mineral SPF 30, $30, is a finishing powder plus sunscreen.